Meadows, fields, prairies, roadsides. Anywhere the host plants are found. This is one of three eastern milkweed longhorn beetles. The female is 5 ⁄16″ to ⅝″ long, slightly larger than the male. The body is robust and has broad shoulders. The head, the plate covering the first segment of the thorax (pronotum), and the hardened wing covers (elytra) are red. The face is nearly flat. The antennae are ½″ to ⅝″ long, about as long as the body. They are all black, not ringed with white or gray. The red base of the antennae is inserted into the black eye, splitting the eye into two parts. Two segmented feeler-like structures (palps) are attached to the lower jaw-like structures (maxillae). The last segment of each maxillary palp is pointed. The pronotum has four small black spots and a raised, disk-shaped hump. Each elytron has five black spots: one in the shoulder region (humerus); a small spot at the base of the elytron near the scutellum; a small antemedial spot neat the suture; a large medial spot near the center; and a small post medial spot near the center. The legs, including the third segments (femurs), are all black. The forward, middle, and back legs each have 5 end segments (tarsi). They appear as 4 segments because the minute 4th segment is concealed by the enlarged 3rd segment. Milkweed longhorn beetles are found on one or more species of milkweeds. The plant species on which the beetle is found is an aid to identification of the beetle species. 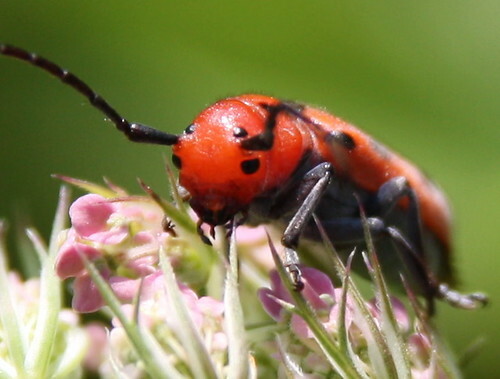 Red-femured milkweed borer (Tetraopes femoratus), as its name suggests, has red femurs. The antennae are ringed with white. The medial black spots on the elytra are no larger than other spots or are absent. It feeds exclusively on showy milkweed. Roots of common milkweed and possibly one or more other milkweed species. Leaves and buds of common milkweed and possibly one or more other milkweed species. Adults emerge in May or later, coinciding with the flowering of common milkweed. In early summer the female lays eggs near the base of a common milkweed stem. When the larvae hatch they bore into the stem. They overwinter in the roots. The exoskeletal plate covering the rearward (posterior) part of the middle segment of the thorax in some insects. In Coleoptera, Hemiptera, and Homoptera, the dorsal, often triangular plate behind the pronotum and between the bases of the front wings. The last two to five sections of an insect’s leg, attached to the tibia; the foot. Red Milkweed Beetle crawling all over the Milkweed today. The milkweed beetle, a herbivore, is given this name because they are generally host specific to milkweed plants (genus Asclepias). It is thought the beetle and its early instars derive a measure of protection from predators by incorporating toxins from the plant into their bodies, thereby becoming distasteful, much as the Monarch butterfly and its larvae do. The red and black coloring are aposematic, advertising the beetles' inedibility. There are many milkweed-eating species of insect that use the toxins contained in the plant as a chemical defense. 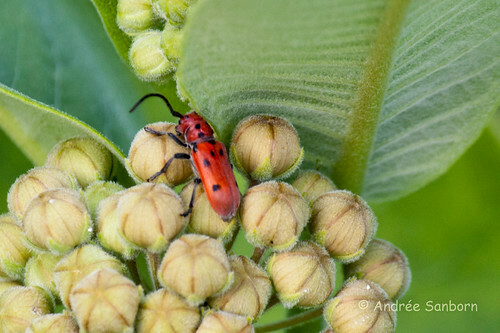 The red milkweed beetle, Tetraopes tetrophthalmus (Coleoptera; Cerambycidae) is a common herbivore on milkweed (Asclepias). Note how the antennal base bisects the eye (a trait referred to by both the genus and specific epithet,meaning "four eyes"). Here a pair of them enjoy a summer morning on July 5, 2011 at Killdeer Plains Wildlife Area in Wyandot County, Ohio, USA. Red Milkweed Beetle feeding on Common Milkweed in my yard in Hamilton County, Ohio, USA. May 24, 2010.